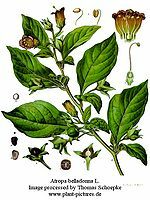 Belladonna is a species of flowering plants in the nightshade family, which is known by the scientific name Atropa bella-donna. Though extremely toxic, it is actually a relative of the potato – toxins found in the nightshade are very similar to the chemicals in the green bits of the potatoes. Its name is a derivative of the Italian phrase meaning “beautiful women” since the toxin atropine was often used to dilate the pupils of women’s eyes for cosmetic purposes. 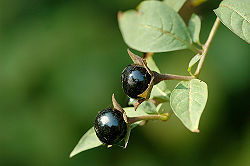 It is commonly known by many names such as deadly nightshade, bittersweet nightshade, black nightshade, Devil’s cherries, murderer’s berry, love apple, sorcerer’s cherry, great morel or just belladonna. Also called dwale - deriving this common name from the French word for sorrow, deuil, or the Scandinavian word, dool, for sleep or delay - deadly nightshade is a very effective poison. Atropa, the genus name, is the name of a Greek Fate who cut the thread of a person's life. 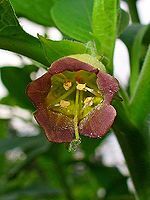 Atropa bella-donna is commonly confused with the Solanum interius, which is also called black nightshade. The belladonna is a perennial dicot. Belladonnas grow to about three – five feet high. There are multiple branched herbaceous stems, usually a blue-purple color. There are typically no more than two to three branches. Oval or egg-shaped leaves sprout from the branches in a dull dark green color and are smooth but veined, with smaller sprouts growing beneath them from the same stalk. An oily, poison ivy esque coating covers the leaves and can cause severe skin irritations. The larger ones grow in pairs opposite each other. They look very similar to a tomato’s leaves. The leaves can be up to eight inches long and are bigger in younger plants than older ones. During the first year of growth, the leaves all sprout close to the ground from a single stem. Belladonna leaves are the heaviest of all in the angiosperm group. The flowers are bell-shaped, formed from one petal, and droop downwards. The petals are blue-purple or red and appear veined. The corolla is shaped into five or so teeth or lobes that flare outwards slightly. The whole flower is no longer than one inch. Inside the petal are five anthers (the pollen-bearing part of a stamen) which are a bright golden-yellow. The anther’s stalks will grow longer once the anthers ripen. The pistil (the ovule-bearing or seed-bearing female organ of a flower, consisting when complete of ovary, style, and stigma) is grooved on both sides and has a honey gland at its foundation. The stigma, the first to ripen, will extend past the anthers. It is thread-like and green. The berries are shiny, black and round with a groove running down the center that divides it into two lobes. They contain the seeds of the plant. These berries begin as a bright green but ripen to black commensurate to the flowers’ ripening. They are very sweet and tempting to curious children; as a result, many children have died from eating only two or three of the berries. The berries have a strong taste, though some say it is sweet while others taste bitterness. The ripened berries are about the size of a cherry. Belladonna roots are white in color, soft and thick. It branches out randomly and reaches about six inches in length. Flowers generally have four parts: the stamen, carpals, sepals, and petals. The stamen produces the pole, carpals grow into fruits which hold the new seeds, sepals protect the bud while it grows, and petals attract the insects. The flowers will bloom in June or July and last through September. A modified stem known as the receptacle bears the flower. The bloom is the sporophyte generation in angiosperms; the flower will produce the gametophyte generation. The stamen is the male part of the plant and is made up of the anther (the pollen-bearing part of a stamen) and the filament which supports the anther. Once the pollen grains are mature, the anther will split open and release the pollen. The pistil is the female part of the plant. It encompasses the stigma (the part of a pistil that receives the pollen), style (a stalk structure in female flower parts), carpal (ovary), and ovules (eggs). Pollination can be carried out by the wind, insects, or birds, bats or other mammals. The pollen is transferred from the stamen of one plant to the stigma of a different flower, either on the same plant (self-pollination) or on a different plant (cross pollination). Pollen grains will germinate on the stigma and grow down the style that supports it to the ovule. Seeds grow from the fertilized ovules. The petals will fall away, leaving the carpal behind to develop. Once the stigma is pollinated, the carpel will begin to grow into a fruit containing the next generation of seeds. The carpal becomes the flesh of the fruit and serves as protection for the ovary. 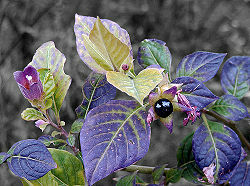 The belladonna’s fruit begins green but darkens as it ripens until it is a deep purple-black color. The seeds themselves are made up of three parts: the embryo, the food supply, and a seed coat. The fruit may fall off the parent plant and sprout. Germination can be challenging and many factors inhibit the growth of the belladonna. It is not a very resilient plant and doesn’t like to be transplanted. Germination takes many weeks; the conditions must be perfect to ensure survival. The soil must be completely sterile, warm and moist. Belladonna is native to Central and Southern Europe, South-west Asia and Algeria; cultivated in England, France and North America (mostly Pennsylvania, Ohio, Wisconsin and California). It has grown rare as of late. In Europe it is almost solely found in abandoned places like ruins and old quarries. the plants proliferate in the shade, in wooded areas, and places rich in limestone. The belladonna shies away from the sun as nearby plants fond of the sun tend to stifle it. Theses conditions usually ensue from being cultivated; open spaces also open them up to insect pestilence. The belladonna grows predominantly in sandy soil, or occasionally in chalk. The soil must be rich and moist. It can flourish even in dry, harsh conditions. Belladonna plants are susceptible to pests like the flea beetle and potato beetle; they are apt to fall prey to wilt disease. A beetle, Crepidodera atropae, feeds upon it, as does the Dotted Clay moth (Agrotis baja). 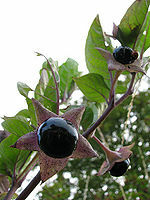 many animals, such as rabbits and deer, have been seen eating the belladonna without any side effects; other animals like dogs, cats and horses are prone to sever reactions and even death. Belladonna can be grown from seeds or cutting of another plant. After purchasing seeds, place them in a freezer for about two weeks. Belladonna seeds must be stratified (to preserve or germinate (seeds) by placing them between layers of earth) before they can be planted. After freezing, soak the seeds in water for at least three days. The water will soften the seed casing so that the seeds will germinate easier. ↑ Plants Toxic to Horses©2010 About.com, a part of The New York Times Company. All rights reserved. ↑ 7.0 7.1 How to Grow Atropa Belladonna From Seed By Kat Yares, eHow, Inc. This page was last modified on 1 November 2013, at 07:46.